The clues that are of note are the truck from the picture here, and Watson. Sherlock PURPOSELY tells him to go back to a specific spot. A vantage point to watch from- or at least behind that small wall blocking his view. It could mean there is something Sherlock is hiding from Watson. Is it the truck that drives away? Very likely. 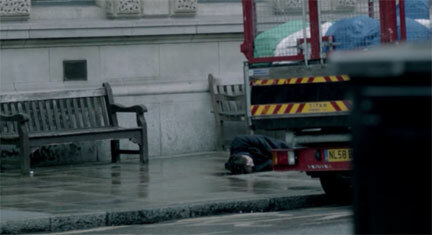 Then again it could be to spare Watson having to see what I like to call- the Reichenbach Splat. Which would be much more doubtful. I'm personally going with the truck- Watson was kept from seeing it, and it conveniently drives away RIGHT after Sherlock lands. What was in it? And there's sure to be much more to it than that. Granted, Sherlock had Molly (the overlooked friend, both by Sherlock and Moriarty) waiting on deck. He knew something was going to happen and needed her help. What the help is/was will have to wait until we see the next episode, The Empty Hearse, on a curiously unlisted date from the season 3 trailer.